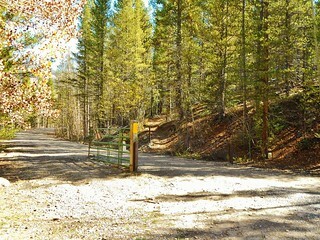 This is the Trail Head. Nice place to park the car. No bathrooms, though. Dennis riding circles around me as I run. 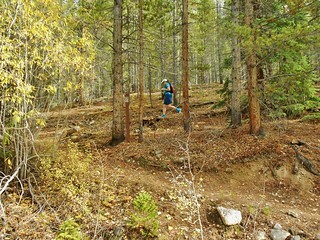 On the steep uphill sections I beat him running. So, about half the time, on the way up to Tennessee Pass, I was in front. 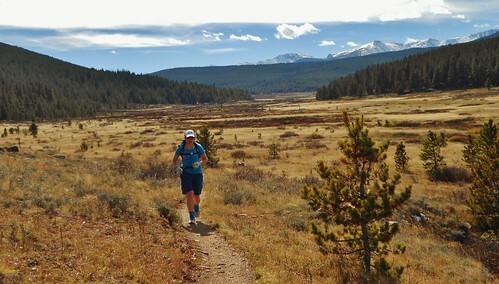 Of course he smoked me on the flats and downhill sections…but it was a great route for us as neither had to wait for too long. 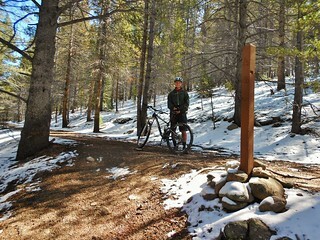 About 1.2 miles from the car, the Jones Gulch Road intersects the CO trail/Continental Divide Trail. 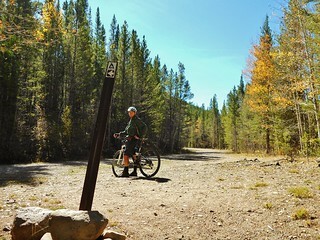 Right here, at the road, it’s a bit confusing where to go to find the CO trail/CDT. 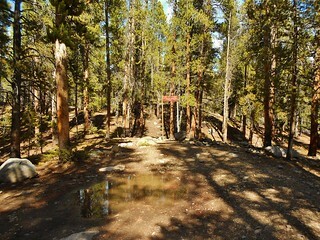 At mile 3, the trail drops out of the forest and crosses the paved highway which goes up to the pass. 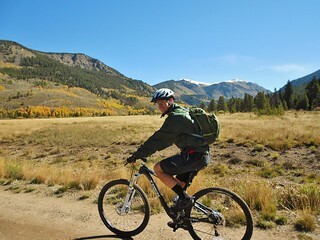 Here’s a picture of Dennis riding down to the road. Here’s the view from the road! 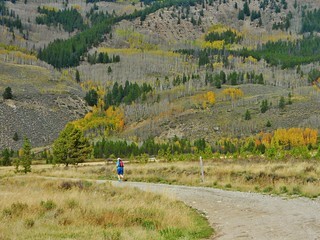 At mile 4.5, we hit the Mitchell Creek Loop Trail. 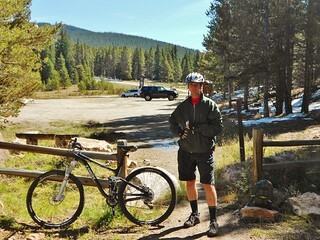 Here’s Dennis, ready to proceed to Tennessee Pass (take a left at this intersection!). 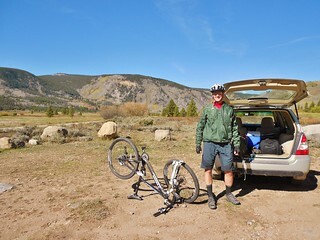 Here I am, about 15 minutes from Tennessee Pass. 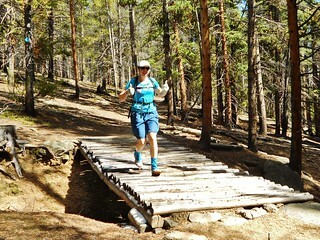 This part was really pretty and all the really steep part was over…so it was a nice cruiser section. 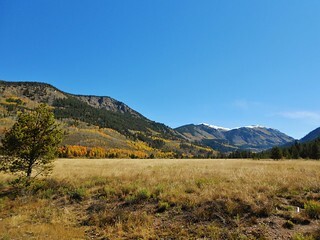 Arriving at Tennessee Pass. It took us 2 hours, from Camp Hale. 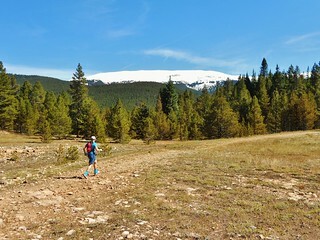 A bit long, for the 6.7 miles, but there was quite a bit of elevation gain and we had some route finding issues due to snow on the trail. Once we got to Tennessee Pass, we took a break for some snacks. 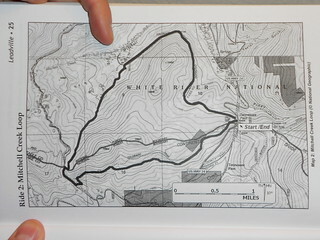 Now, it was time to do the Mitchell Creek Loop. I was looking forward to the loop, so I headed off into the woods. I caught up with some hikers who were staying at a hut for the weekend. There was an intersection which was not on my map, so I paused to tie my shoe and when they caught up, I confirmed I was still on route. 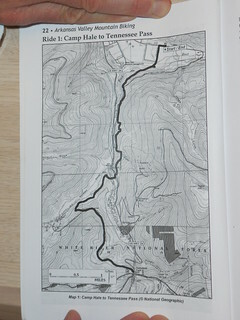 The Mitchell Creek Loop is a nice run/ride/hike, but there are sections which are not marked, so it’s very important to have a map and compass, or a GPS. Finally, I caught up to Dennis. He was waiting for me at the bridge at mile 2.4 (around the loop). After this bridge, we had a bit of uphill to get on the other side of the mountain so we could head back to Camp Hale…after the steep uphill section, at mile 3, we saw the following sign. The sign in this picture is only about 20 feet from the sign in the last picture, but Dennis’ book said it was several hundred feet (so that was confusing to us). From this spot, we went down the road for about 10 minutes until we were in a very large flat area with a building, road intersection, and a huge sign. 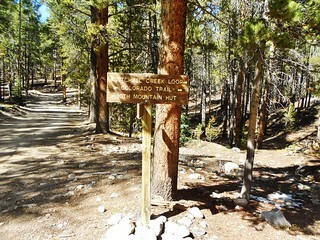 The Mitchell Creek trail goes to the right of the large sign/trail head kiosk. 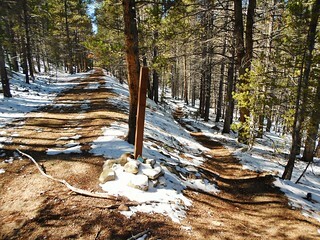 It is pretty tricky to figure out, but eventually, the trail is obvious and it’s a lovely downhill run/ride. 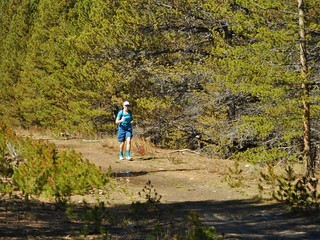 At the bottom of the long downhill section, there is a veritable bog. It’s not pleasant for riders or runners. Our feet got wet getting through the deep mud and puddles. The good thing is that it doesn’t last for too long, and in the fall, it’s a lot less wet than it would be otherwise. In about 80 ft, if memory serves, we were back on solid ground. 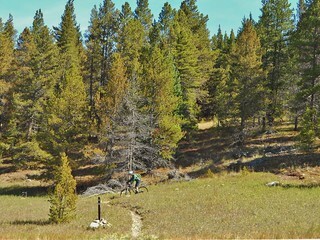 Eventually, you have to go uphill for a bit, to get back to the double track road where the trail to Camp Hale descends. Finally, the loop is over! 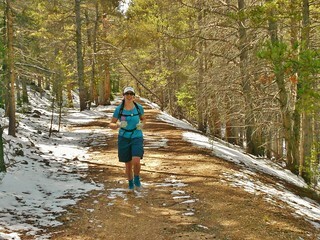 Here I am, looking forward to the last 3 miles downhill to Camp Hale…It’s starting to get really cold outside, so I have to keep moving. Cruising down the last couple miles was really fun! Crossing the bridge means I’m almost back to the car. Yay! When we get back to the car, I’ve only done 18 miles and I’m supposed to get in 20…so I take off down the road and Dennis picks me up on the way out. I really enjoyed this run. 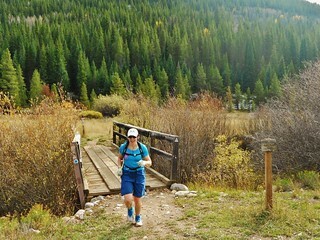 The challenge of climbing Tennessee Pass, the fun ups and downs of the Mitchell Creek Loop, and the fantastic views present along the way. It took us about 5 hours to complete the run. We definitely took our time with route finding and had lots of stops for snacks. I thought it was also fun doing this route with Dennis, he’s normally not on my longer runs and it was nice to have his company! 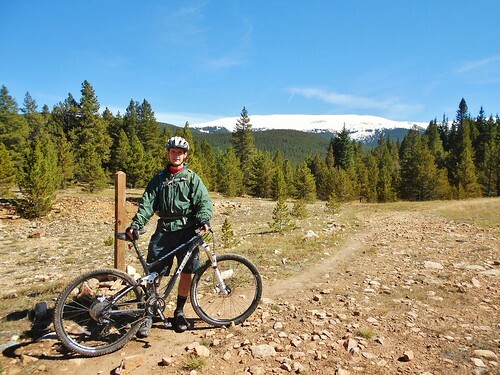 This entry was posted on Friday, October 3rd, 2014 at 4:48 pm and is filed under Mountain Biking, Running. You can follow any responses to this entry through the RSS 2.0 feed. Both comments and pings are currently closed.